Snake Valley • Utah hasn't signed a negotiated deal, so Nevada agency is considering lawsuit to Supreme Court. File | The Salt Lake Tribune Rancher Dean Baker looks over what was once a lush meadow in the Snake Valley in this 2008 photo. 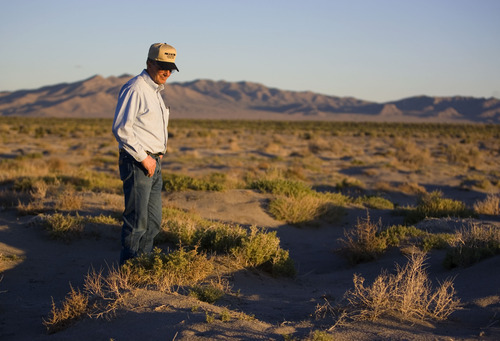 File | The Salt Lake Tribune Rancher Dean Baker looks over what was once a lush meadow in the Snake Valley in this 2008 photo. While the Bureau of Land Management excluded the valley on the Utah-Nevada line from its recently released final Environmental Impact Statement, the battle over groundwater is likely to continue. Las Vegas isn't nearly done with Snake Valley  or its water. The issue of whether groundwater in the arid Snake Valley that straddles the Utah-Nevada line can be pumped and piped to Las Vegas could land before the U.S. Supreme Court. In an email to Southern Nevada Water Authority (SNWA) board members last week, General Manager Pat Mulroy said the agency should consider a lawsuit to the nation's top court for Utah's failure to sign a negotiated settlement that would grant Nevada some 50,000 acre-feet per year of Snake Valley water. Mulroy's communication, dated Aug. 2, came as the federal Bureau of Land Management released a final Environmental Impact Statement that makes it appear likely it will grant rights of way across four Nevada valleys. That would allow SNWA to move forward with its $15.5 billion project to pump desert groundwater for transport to Las Vegas. The BLM, however, appears not ready to grant rights of way for Snake Valley. That outcome  which is reversible  was based on the fact that SNWA does not yet have water rights in Snake Valley, John Entsminger, the water agency's deputy general manager, said in an interview Monday with The Salt Lake Tribune. Nevada Engineer Jason King has yet to rule on the Las Vegas-based water agency's application for Snake Valley water rights, Entsminger said. King had agreed not to hear the matter until 10 years after the 2009 agreement negotiated between Utah and Nevada. "Our groundwater applications [for Snake Valley] are still pending before the state engineer," Entsminger said. Further, he said, the BLM did not grant SNWA rights of way in Snake Valley because the Nevada engineer had not yet granted the water rights there. But the Las Vegas-based agency will apply again for that right of way once it is granted water rights in Snake Valley. "Nothing in the [BLM's] final EIS precludes us from pursuing those rights of way," he said. The lack of Utah Gov. Gary Herbert's signature could make the process more time consuming. Nevada's inquiries to Herbert's administration have gone unanswered, Entsminger said. "As a result of the silence from Utah, we feel it's time for Nevada to exercise its legal options," he said. Whether that's bluster or not, Herbert is taking the subject "very seriously," said his spokeswoman Ally Isom. She called the BLM's environmental analysis a "positive for the state." But, she noted, the governor realizes "there are long-term implications" in the Utah-Nevada agreement and SNWA's efforts to tap Snake Valley water. The governor has not signed the agreement yet, she said, because his administration continues to analyze it. "This is an important agreement, and it bears due diligence," she said. "He is in the process of having state water experts weigh in." The governor also is reviewing the final EIS, Isom said. It analyzes the environmental impacts of SNWA's plan to pump and pipe 84,000 acre-feet of water from Spring, Cave, Dry Lake and Delmar valleys in the eastern end of the Great Basin in Nevada. The project envisions 263 miles of water pipeline, 230 miles of overhead power lines, six electrical substations, two pumping stations, a 40-million-gallon storage reservoir and a 165-million-gallon treatment facility.